When you happen to come upon the web ad of the HP Pavilion HDX9160EA, it would literally make you stop and take a second look at this notebook. The design alone would make you do a double take. The HP Pavilion HDX9160EA is completely customizable. You can choose from Intel Core 2 Duo Processors T7500, T7700, T7800 or the more powerful Intel Core 2 Extreme Processor X7900. The HP Pavilion HDX9160EA has a 20.1 inch screen, 256MB Mobility Radeon HD 2600XT graphics card and a choice of 240GB or 500GB SATA dual hard drive. 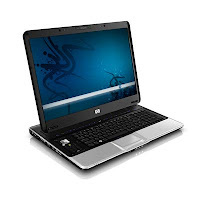 The HP Pavilion HDX9160EA is a very powerful laptop and media center. Though this won’t be a good laptop due to its weight, it would be a great portable media center as you can easily transfer it around the house or take it with you on short trips. There’s a remote control on the left side so you can easily control your windows media center, plus with the option of choosing a 1080p screen and HD-DVD drive, the HP Pavilion HDX9160EA is your complete home entertainment media center. The only disadvantage I can see with the HP Pavilion HDX9160EA is that it should just remove the notebook on its name or brochure because frankly, at 15 pounds, you can’t exactly use this on your lap. As a Blu-ray fan, I don’t like the fact that HP is sticking with the HD-DVD drive option only, however, you can always get yourself an external Blu-ray drive but that would probably cost you.